The Community-Based Plan of the Month is a new feature, highlighting plans included in Planning for All New Yorkers: An Atlas of Community-Based Plans in New York City, an interactive map created by the Municipal Art Society and the Community-Based Planning Task Force. As the recent economic slowdown gives us the opportunity to take a step back and reevaluate New York City’s planning processes, community-based plans can provide a framework for growth that works for all New Yorkers. The plans featured in this column will provide examples of how inclusive planning processes work on the ground, and ideally will help inspire future community planning efforts. When the Fort Hamilton Parkway interchange of the Prospect Expressway was completed in 1962 under the direction of Robert Moses, a small, eight-block section of Windsor Terrace, Brooklyn was severed from its neighbors. This quirky area was once home to a number of horse stables due to its proximity to Prospect Park, but now only one remains: Kensington Stables, located at East 8th Street and Caton Avenue. Since Claremont Riding Academy near Central Park closed last year, Kensington Stables is among New York’s few remaining urban stables. The desire to preserve the stables and the low-rise residential enclave that surrounds them inspired a group of residents to come together in 2005 to plan for their neighborhood’s future. 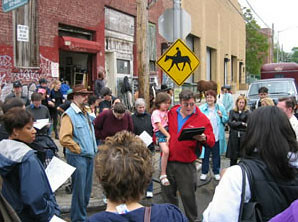 Calling themselves the Stable Brooklyn Community Group, they began organizing their neighbors with a walking tour to survey vacant lots and buildings under development (shown above in front of the stables, via the group’s website). Next, homeowners, renters, visitors, and equestrians discussed the neighborhood’s development, traffic, sanitation, and safety concerns with representatives of Brooklyn Community Board 7 and the Brooklyn Borough President’s Office. In spring 2006, representatives from the Hunter College Center for Community Planning and Development led two community visioning workshops in the neighborhood. The process culminated in the release of a report, Stable-izing Brooklyn (PDF), in July 2006. Read more after the jump. Concerned with the potential for large, out-of-scale development on empty lots, the Stable Brooklyn group recommended contextual zoning and suggested that commercial overlays be maintained to encourage development of local retail options in this underserved area. “The zoning we proposed was in line with making a neighborhood,” said Mandy Harris of the Stable Brooklyn Community Group. In addition to rezoning recommendations, Stable-izing Brooklyn included a number of other proposals, many of them related to the safety of pedestrians and equestrians in the high-traffic areas near the expressway and the park. Brooklyn Community Board 7 held its public hearing on the rezoning last week, and according to Harris, is expected to give the plan a positive vote on Thursday. The plan will then move on to the Borough President, the City Planning Commission, and the City Council for final approval. “It should go through quickly, I hope,” said Harris. In addition, shortly after the report’s release, the group met with the Department of Transportation. Harris said she feels confident that the City will implement some of the group’s recommendations, such as alleviating traffic at Park Circle at the southwest corner of Prospect Park, where many equestrians enter and exit the park. She added that she hopes that the Stable Brooklyn group will be involved in the development of such a plan as it moves forward.